Traditional classical music from India. With Amjad Ali Khan with his sons; the Shehnai Ensemble of Bismillah Khan. A raga for the early morning, executed by sarog-player Amjad Ali Khan with his sons Amaan & Ayaan, also on sarod. The trio is accompanied on tabla by Shafaat Ali Khan. Cd. Amjad Ali Khan with sons Amaan A. Bangash & Ayaan A. Bangash – Amjad Ali Khan. Label: Chhanda Dhara (2002), code: SNCD 70701. Tracks 1 and 2 – 41’36. Executed by the Shehnai Ensemble of Bismillah Khan. Cd. 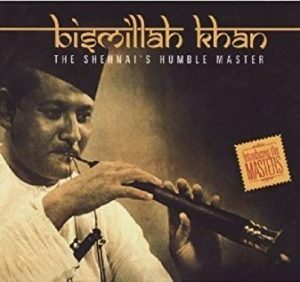 The Shehnai’s humble master (2) – Bismillah Khan. Label: Saregama (2008), code: CONFC150712-2. Track 4 – 16’52.